KIRKLAND, AZ October 30, 2017: We all remember Smokey the Bear’s familiar message: “Only YOU can prevent forest fires”. 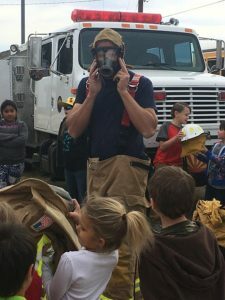 The students at Kirkland Elementary School were treated to a personal visit from America’s favorite Mascot, along with Chief Kellie Brasher, Southern Yavapai Fire Department, State Forestry personnel and Yarnell Fire representatives. Smokey also made an appearance at Model Creek School in Peeples Valley earlier this month. 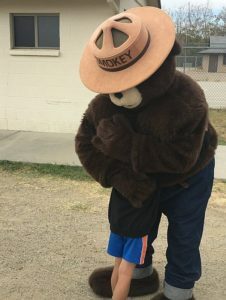 Smokey’s activity in Yavapai County is partly due to the formation of a Fire Department Coalition to promote wildfire awareness, educating people about the importance of being prepared. The Wildfire Adapted Community Coalition includes Congress, Yarnell, Peeples Valley, Southern Yavapai and Williamson Valley-Bagdad Fire Departments. “The purpose of education is more than simply knowledge. It is the foundation for accomplishing something important for our small rural towns,” says Bruce Olson, Educational Supervisor for the Coalition. These important things include evacuation prep and mapping, creating defensible space around homes and prevention of human caused fire. Contact Denise Roggio for information by calling 928-427-6578.